Sire & Dam Analysis has something which was never initially looked at at UK Horse Racing but was always one of those tasks that "we'd get around to" and it's taken over ten years before we started to look at this field. Clearly there must be something in it otherwise there wouldn't be such an importance as the bloodstock industry within the racing game. The question that we have to ask ourselves, as we always do with everything associated with racing, is there something in this or is it all smokes and mirrors? So in the early summer of 2014 we started to add more data to the ratings showing the sire and dam statistics of every horse to see how they have performed and when we'd finished there were five extra pages were added to the ratings for each race showing various forms of the Sire & Dam statistics. 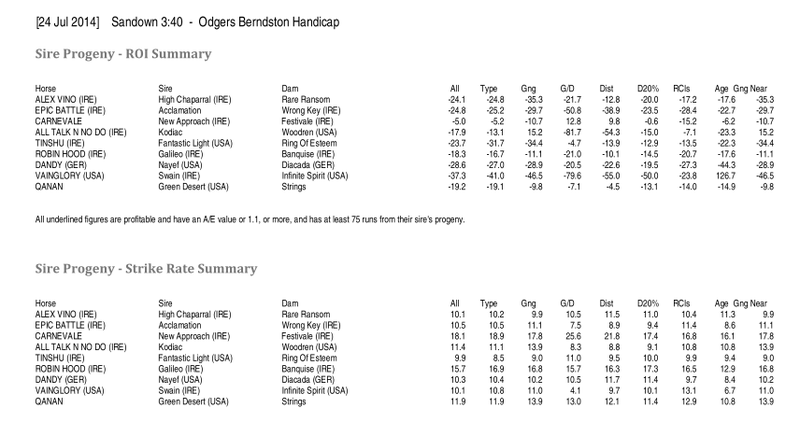 These following extracts from the ratings shows an example of how the Sire & Dam data is presented. The first table shows the nine horses declared for the 3.40 Sandown on the 24th July, 2014. The top rated horse in this race will be Alex Vino (these are always displayed in rating ranking order) and we can see here that the sire (the father) of Alex Vino is the famous High Chaparral. The Dam, the mother, is Rare Ransom. Like most of the statistics within UK Horse Racing everything is taken for the previous five years so this means that if any of these horses were siring foals for more than five years then we would disregard the earlier years. This first table looks at how all the progeny of the sire and dam have done in this period. So, for Alex Vino we've established that the sire is High Chapperral. Now, if we look at all the horses, male and female, sired by High Chaparral then in the last five years these, collectively, have made 3,626 runs and have had 365 winners. If we had backed each of these runners with a £1 stake at the industry starting price then we'd be down £872.60 with a strike rate of 10.1% and an overall negative ROI of -24.1%. Looking at this horses competing in this race we can see that none of their sires' offsprings made a profit for their sire. This isn't unusual. The last column in this section is entitled A/E, which stands for Actual/Expected and more information can be found in the A/E FAQ. The important thing to remember is that an A/E value of greater than 1.0 is something to take notice of. The next six columns in the table are repeated with different values. In these columns we're looking at the statistics from the Dam's progeny. In the above example if we look at the statistics for Tinshu, the fifth rated horse, we can see that the Dam is Ring Of Esteen. There have been a total number of 132 races run by those out of Ring Of Esteem of which 15 won making a strike rate of 11.4%. If we'd backed each of these for £1 each then we'd be showing a profit of £68.40 at industry SP. That is the basis of the first table. A lot of information given for all of the sires' and dams' progeny over the last five years. The 3.40 Sandown, though we can't see it here, is a Flat race. The second table, Sire/Dam - Race Type, gives us the same information as before but this time we're only looking at all those runs by all those horses from these sire and dams but only if the race was run on the flat. High Chaparral's offspring ran a total of 3,626 times. We know that because it's in the first table. But of those runs there were 1,921 which were run on the same race type as today. This second table then shows the results on the flat. An interesting observation is that horses out of Ring Of Esteem (the dam of Tinshu) are profitable overall with a 11% strike rate but when they're running on the flat the strike rate nearly halves and they're no longer profitable. This is the sort of picture which we're trying to build with these. We've already looked at two different aspects of the Sire & Dam data. We've looked all of the statistics from the last five years and we've seen the statistics of all those run on the same race type over the same time period. It's not hard to consider that we can look at other aspects, which we do. We also look at races run at the same distance as today's race. We also look at the same going as well as the same going and distance. If we appreciate that the going reports and forecasts from the courses are inaccurate at best then we may look at the figures for those which have run on near enough the same going which we call going and adjacent going In this case we may consider good along with good to soft conditions as being the same thing. We also look at the figures of those horses which have run within 20% of today's distance. In this case a six furlong race today would consider everything from a five furlong race to just over seven furlongs. The reason for this bit of wobble and leeway with the going and distance is that racing doesn't work on discrete numbers and so it may not be correct to look at, say, six furlongs dead. The figures from these tables are there to give parts of the overall picture. The next illustration shows something similar; this time it's looking at the Race Class. As you may be aware UK Horse Racing doesn't use the discrete classes favoured by the various authorities and by almost all of the punting population and as we calculate the Race Class to an obscene number of decimal points we're obliged to use a range of range of race classes. The last example is much the same thing as all the other tables but this time looking at the ages. By this we're looking at the age of each horse. In this particular race the top rated Alex Vino is a three year old, so we're looking at his sire's and dam's offspring to see how they ran as three year olds. The second rated here, Epic Battle, is a four year old at the time of the race so we're looking at his sire's and dam's four year old offspring to get his age statistics. Whilst all of the above is rather inclusive it does contain an awful lot of data. Some would say that it contains too much data. Because of this a pair of summary tables have been created to make a quick glance over the tables easier, as shown below. Here we can see two tables, the top one is for the sires' statistics for every horse which is then followed by the dams' statistics below. In these tables, after the sire and dam names are nine fields, one for each of the preceding tables. In each of these colums we're getting the ROI from the corresponding table listed here. So we can see, at a glance, which fields for which horse have been profitable remembering that the ROI% (Return on Investment) is positive when there's a profit and negative when there's a loss. Some of the values in these nine tables are underlined or, if you prefer, underscored. These show the figures which return a profit and are shown thus for ease of identification. However, on the Summary tables, as we can see in the example above, the figures are only underscored when there's not only a profit, but also there have to be at least 75 runs and an A/E figure of at least 1.1. This, effectively, ensures that the data is plentiful to be meaningful. All of this information is in the daily CSV file and in the archived files. This then means that we can use the Data Analysis Tool to dig deeper into any of these figures. This is only the start of the exploration into this field. Already we have a member develop the Koulds Scoring System which is very useful at finding well-bred horses and has been the basis of a number of systems one being the excellent Koulds Dam System. See http://blog.ukhorseracing.co.uk/2018/04/06/sire-dam-calculations/ for more information.